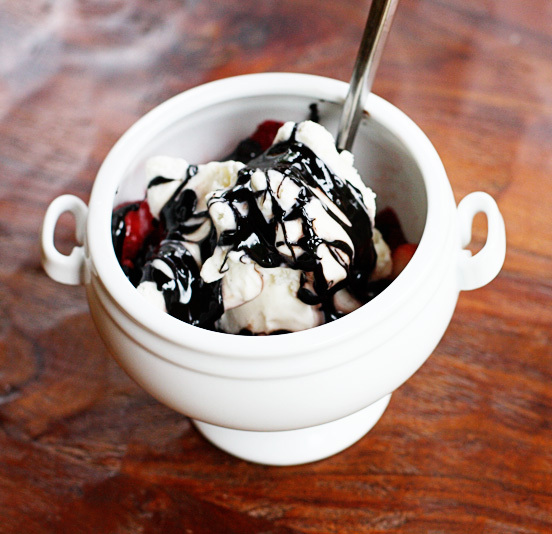 Coffee ice cream drowned in homemade hot fudge. Strawberries dipped in warm, gooey fudge. I hope so, because I have got a GEM of a recipe for you today! This is an old recipe that I can’t believe is not on this blog already. Trust me on this one, you NEED this in your life… and SOON! 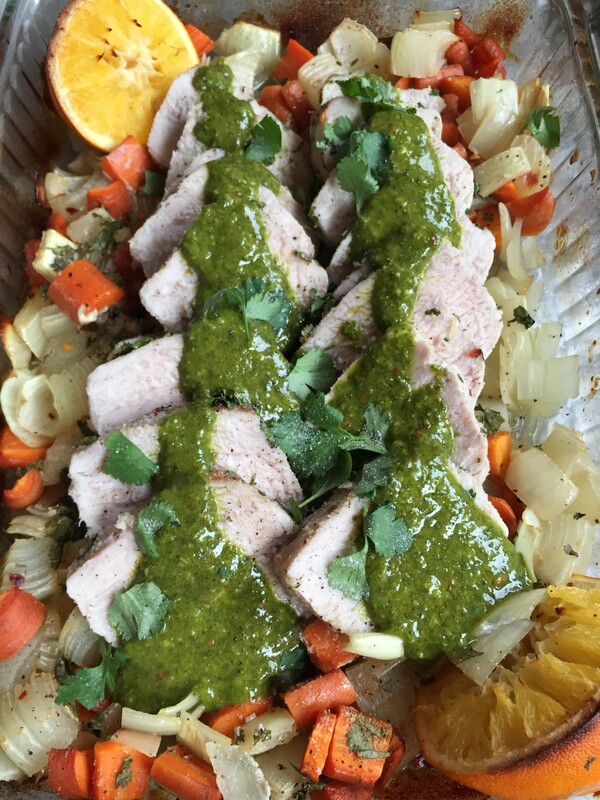 Citrus Roasted Pork Loin with Chimichurri Sauce & Cilantro Rice. It sounds like a lot of work, but I promise it’s not! A perfect weeknight family dinner, or something to impress dinner guests… there is so much flavor packed into this simple dish that you will want to make it again and again! My house smells so good right now, I can hardly stand it. 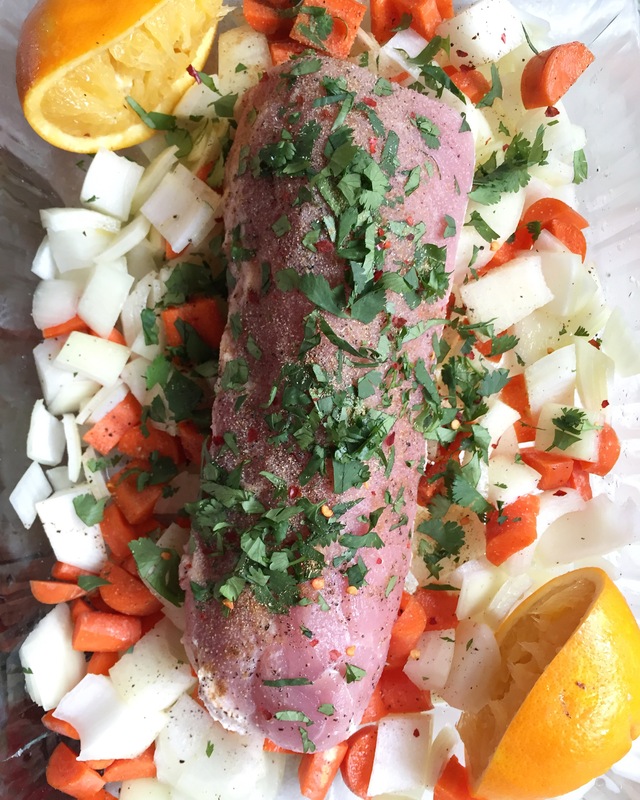 A beautiful pork loin is in the oven with onions, carrots, oranges, cilantro and spices, and rice is simmering away on the stove ready to be dressed with fresh cilantro and a splash of citrus. The chimichurri sauce alone is worth drizzling over everything you can think of (french fries! 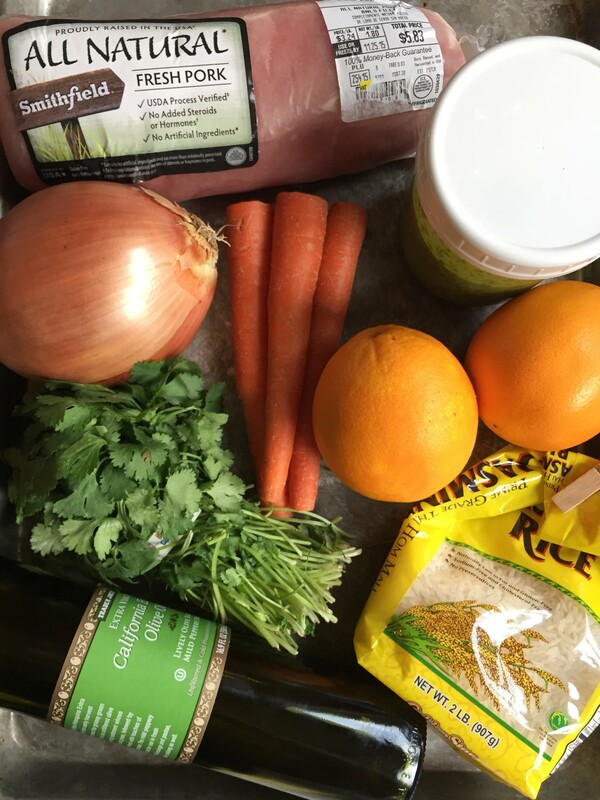 ), and the fresh, bright cilantro rice is the perfect addition to this simple, delicious pork. Do you ever find yourself as stuck in a dinner-rut as I do? I keep making the same things for my family over and over again and eventually they are just tired of what I’m serving them – no matter how much they usually love it! I am always looking for a good deal on great meat, and this Smithfield all-natural pork perfectly fits the bill. The quality is amazing, the price is great, and it’s available at my local Walmart! Put the parsley, cilantro, garlic, vinegar, salt, pepper & crushed red pepper flakes into the bowl of your food processor (or a blender) and pulse until well chopped. Drizzle in the olive oil while the food processor is running. Transfer to an covered container and place in the fridge if you are making this up to 3 days ahead, or leave out on the counter if you are going to use soon! Preheat the oven to 400ºF. Lightly oil a 9x13" baking dish and put the chopped onion and carrot into the bottom. Place the pork roast on top of the veggies and rub a little bit of olive oil all over the pork. Season everything with the salt, pepper, cumin, garlic and crushed red pepper and then squeeze the juice of one orange all over the meat, setting the orange halves into the pan when you are done. Roast for 40-45 minutes, until the internal temperature is 150ºF, checking every 5 minutes or so near the end to make sure it doesn't get overcooked! While the pork is in the oven, bring 4 cups of chicken broth to a boil in a medium saucepan. Once the broth is boiling, stir in the salt and the rice and then reduce the heat to low and simmer for 15-20 minutes, until the liquid is all absorbed. Squeeze one half of the remaining orange juice into the rice.and gently stir in with the butter and cilantro. When the roast is done, slice it and drizzle with a generous spoonful of the chimichurri sauce. 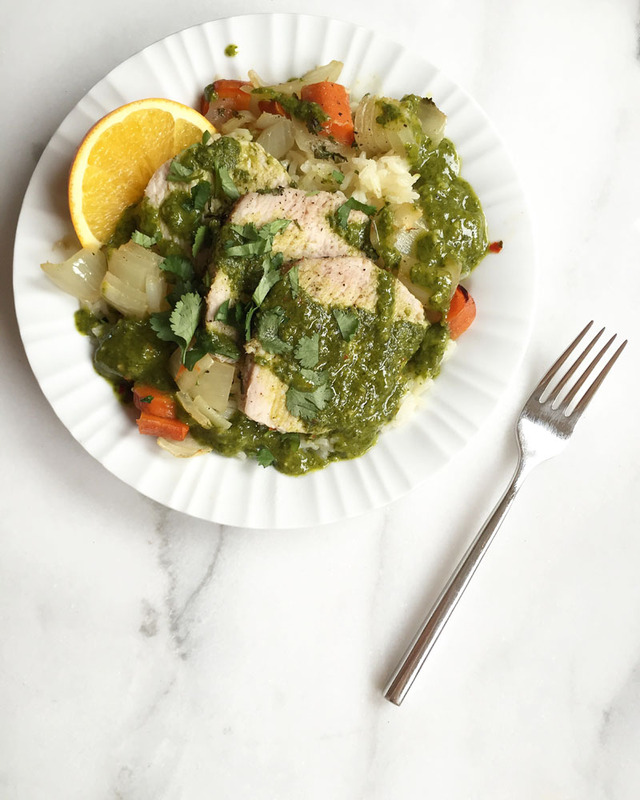 Serve the pork and rice with more chimichurri sauce on the side and a few slices of the remaining orange half on each plate! Rich, fun, extra-chewy and naturally gluten-free (if you make sure your oats are not cross-contaminated! ), these Monster Cookies are absolutely the best I’ve ever made. And I have made a lot of Monster Cookies in my time! Now, I’m absolutely not saying there was anything wrong with the original recipe, but there is always room for improvement and I think I have found a few little tricks to make these even better. 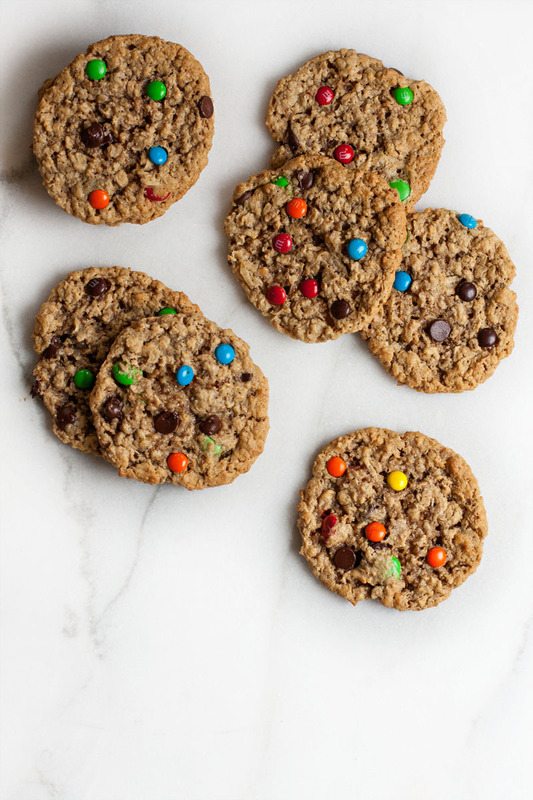 If you’ve ever made Monster Cookies before and thought “these didn’t turn out like I expected”, then this recipe is for you!! You can make these big or small, just adjust the time accordingly and watch carefully to make sure they don’t get overdone. You just want the edges to be golden so they are not dry. 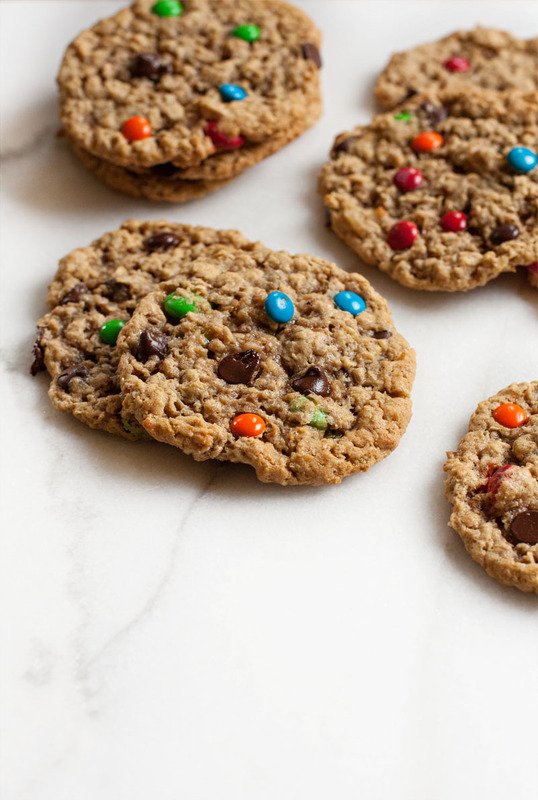 These cookies are better under-baked then overdone! Scoop out the cookie dough (balls twice as big as you want in the end) closely onto a cookie sheet and chill in the fridge for at least 30 minutes, or overnight. When you’re ready to bake, preheat the oven and then take each cookie dough ball and break it in half like you are cracking open an egg and place the halves craggily-insides-up onto parchment-lined cookie sheets. 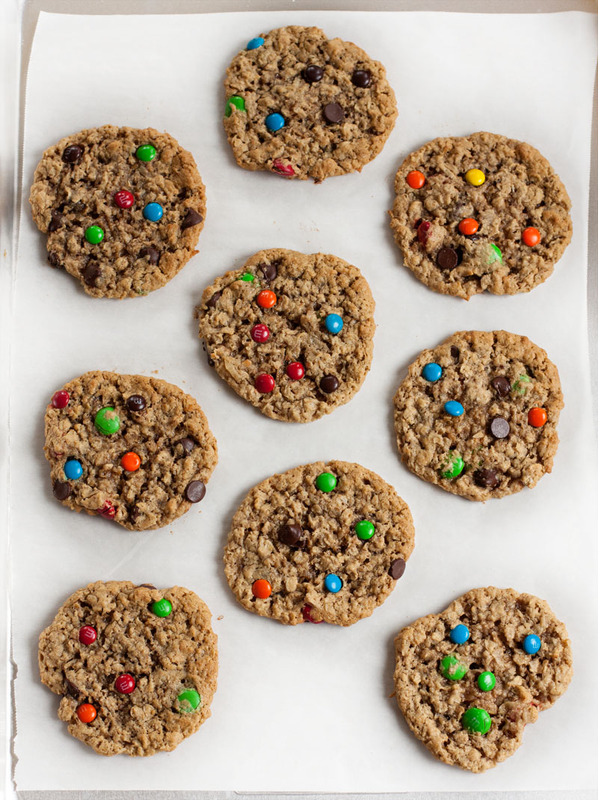 When the cookies bake, they will be nice and chewy and all the yummy insides (chocolate chips, m&ms, etc!) will be showing, instead of hiding inside! In a large mixing bowl, cream together the butter, peanut butter and sugars until light and fluffy. Beat in the eggs, egg yolks, vanilla & baking soda until well blended. Cover the bowl and place in the fridge to chill for at least 30 minutes while you preheat the oven to 350ºF and line several baking sheets with parchment paper. Scoop the dough onto the parchment lined cookie sheets, and flatten with a fork dipped in water. Bake for 8-10 minutes, until the cookies are just set and light golden brown around the edges.